They're popping up all over to the delight of book lovers. What are they, you ask? Pop-up libraries, the newest trend that is gaining in pop-ularity (pardon the pun). They are essentially makeshift libraries – structures have ranged from converted phone booths to upside down tanks, such as the temporary Little Free Library in New York City's Nolita neighborhood – in various locations where people can take a book of their choice and drop one off in exchange. Best of all, they are free. 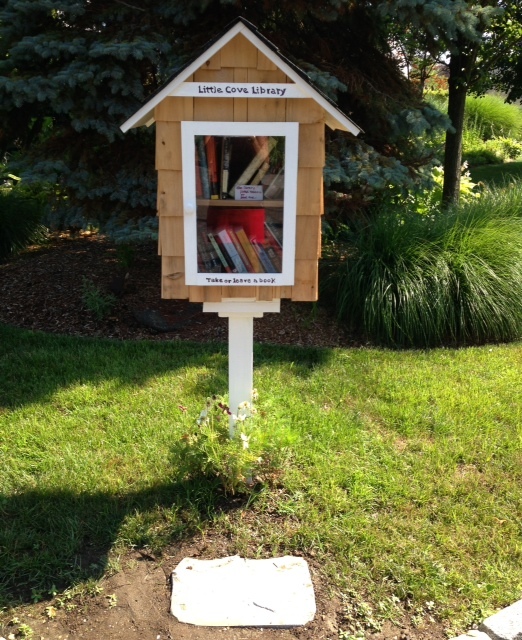 One local resident who has jumped on the bandwagon is Old Greenwich resident Susan Rohrer, who recently installed a pop-up library on a corner of her property. "I read about this in O Magazine (Oprah Winfrey's monthly publication)," she said during a telephone interview. "It really seemed like such a good idea, especially if you love books as I do." Rohrer did research into getting one, and eventually had one made for her by a friend's brother. Her library has a personal touch in that it is a mini-version of her own home, complete with natural shingle. Rohrer said that she has also seen another pop-up library in Greenwich's Tod's Point. "Mine holds about 50 books, and it's been really fun to see what kinds of books people leave," she said. "I've gotten all kinds, especially children's books." Rohrer thinks this trend will be a way to help keep physical books alive. "Everyone now is glued to their electronic devices and reads on them," she said. "Technology is great, but I would like to think that the traditional book form can survive among the younger generation. And, this is also a great way to recycle books."